One of BHP Iron Ore's GE AC6000W locos in the Pilbara, Western Australia. The Australian MSTS scene is growing with several Australian designers of locos, train sets and rolling stock adding to the world-wide collection of free MSTS add-ons. As well, Australian MSTS enthusiasts are contributing to the many ways to improve MSTS by sharing their innovative ideas with the international MSTS community. All those who use their talents to help us enjoy MSTS to a greater extent know we appreciate their work when we download and install what they freely make available. Of course, a short post of congratulations for the enjoyment their work gives us lets them know we value their time and effort. 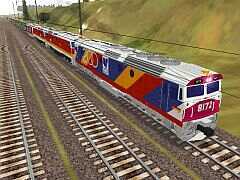 auendvr.zip (7.4Mb, 27-Sep-02): NSW Countrylink Endeavour trainset by Brendan Robinson. See endxplfx.zip for an updated ENGine file. aupclav2.zip (1.7Mb, 17-Nov-01): Victoria V/Line P-class loco. au_y108.zip (7.5Mb, 02-Aug-02): WCR 1889 Y-class steam loco with cabview & sounds. au_y112.zip (7.5Mb, 02-Aug-02): WCR 1889 Y-class steam loco with cabview & sounds. ytendfix.zip (109kb, 04-Aug-02): tender fix for above Y-class locos. b_xpt10.zip (975kb, 27-Sep-02): blue-liveried XPT by Michael Greenhill. This set installs over the candy-livered version by Chris Jennings. b_xpt11.zip (978kb, 29-Sep-02): updated blue-liveried XPT by Michael Greenhill. The set now installs in its own folder. clxpt1b4 (582kb, 07-Jun-02): NSW Countrylink XPT. See the XPT ENGine tune up page for some suggested changes. crvset11.zip (6.2Mb, 07-Jun-02): NSW CityRail double-decker multiple interurban units in 4 liveries (superceded - see vset12a.zip below). endxplfx.zip (264kb, 29-Sep-02): updated ENGine files for Brendan Robinson's Countrylink Endeavour & Xplorer trainsets. 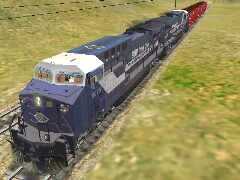 explorer.zip (16.5Mb, 20-Sep-02): NSW CountryLink Explorer trainset (EA, EB and EC cars, cabview) by Brendan Robinson. See endxplfx.zip for updated ENGine files. nraddon1.zip (664kb, 03-Aug-02): NR28 (weathered) & NR88 diesel locos. nraddon2.zip (585kb, 12-Aug-02): NR53 TraileRail & NR56 SeaTrain diesel locos. qr23.zip (691kb, 12-Aug-02): QR Class 23 diesel loco. ssetce1.zip (2.6Mb, 27-Sep-02): CityRail S-Set electric double-decker suburban passenger trainset by Chris Jennings. t399.zip (1.5Mb, 20-Sep-02): VR T class #399 diesel loco in weathered VR livery. tangara.zip (1.1Mb, 13-Jul-02): NSW CityRail double-decker Tangara T set suburban trainset. vr_ts.zip (1.9Mb, 14-Jun-02): Victorian Rail T-class T320 & T322 locos. vset12a.zip (6.7Mb, 28-Aug-02): updated NSW CityRail double-decker multiple interurban units in 4 liveries by Chris Jennings. AU_NR_Setup.exe (1.1Mb): 4 (former) National Rail locos in TraileRail (NR53), SeaTrain (NR57), SteelLink (NR60), and standard (NR82) liveries. See NR engine upgrades to upgrade the ENGine files for prototypical performance. AUnsw4201_Setup.exe (1.1Mb): NSW GR #4201 in the livery used to celebrate 125 years of NSW government railways. AUnsw81_Setup.exe (1.2Mb): NSW class 81 locos #8120, #8126, #8169 and #8172. See NSW 81 & 82 engine upgrades to upgrade the ENGine files for prototypical performance. Class82NSW.zip (999kb, 27-Oct-01): NSW FreightCorp class 82 loco #8203. See NSW 81 & 82 engine upgrades to upgrade the ENGine file for prototypical performance. AUnrROCY_Setup.exe (577kb): open freight wagon ROCY type, in standard and "SeaTrain* liveries. AUnswNQOX_Setup.exe (3.6Mb): 10 flat wagons, 1 empty, the others carrying various containers. gh.zip (919kb, 21-Aug-02): VR GH wheat wagon. gh_dirty.zip (973kb, 21-Aug-02): VR GH weathered wheat wagon. 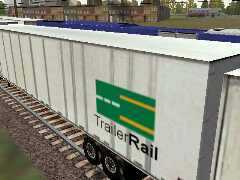 gh_fix.zip (300kb, 22-Aug-02): fix for VR GH wheat wagons, both GH & GH dirty. m_stock.zip (457kb, 14-Jun-02): VR "M" stock wagon. nkhy.zip (1.2Mb, 30-Jul-02): NSW slab stell wagons (Gavin Mclaughlan). nody.zip (682kb, 28-Jul-02): 6 NSW NODY wagons, some with, others without tarpaulins (Gavin Mclaughlan). vhca.zip (1.0Mb, 16-Sep-02): VR cement wagon by Russell Beer. vhja.zip (534kb, 22-Sep-02): VR gypsum hopper by Russell Beer. vpcx.zip (856kb, 26-Sep-02): VR VPCX cement wagon by Teemu Saukkonen. vr_signs.zip (200kb, 26-Sep-02): VR permanent way signs by Russell Beer. wgnsnd2.zip (936kb, 09-Sep-02): Wagon noises (wheel flats, screeching, sheep, cow, pig, refrigerated containers) by Gavin Mclaughlan & Chuck Zeiler. zdbrake.zip (1.2Mb, 14-Jun-02): VR 1879 ZD brake van. zl_van.zip (639kb, 14-Jun-02): VR ZL guards van. zlp.zip (624kb, 14-Jun-02): VR ZLP guards van.